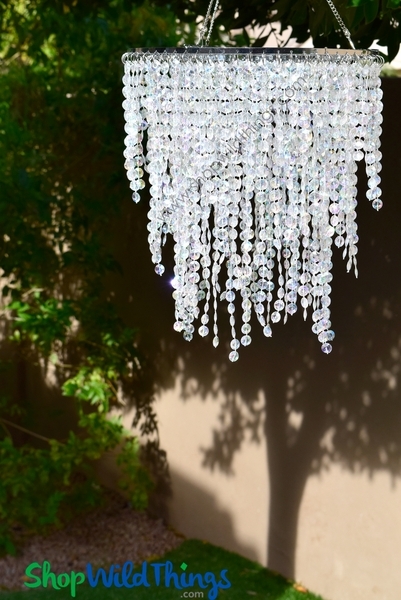 Our new Ashlynn Crystal Beaded Chandelier is not only fun and attractive but it's also very versatile! You can certainly hang this from the ceiling but it also works well as a centerpiece! However you choose to use it you can easily add a Light Cord Kit (sold separately), place an LED light saucer on top or just display it as it comes. The center of the chandelier already has the hardware needed to hold the light kit in place. 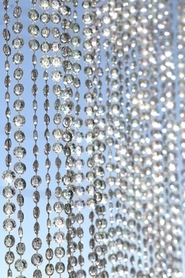 By itself, Ashlynn is charming with its 3 scalloped layers of beautiful crystal beads that have an iridescent coating which gives the beads a slight pastel hue that intensifies with light. The bead strands on the outer tier range from 2" to 6" long, the middle tier strands range from 6" to 9" long and the inner tier strands range from 10" to 12" long. The chain is 10" long so the total hanging length is 22" long. Ashlynn is 10 1/4" in diameter, the inner ring is 6 1/4" in diameter and it weighs 1.5 lbs. 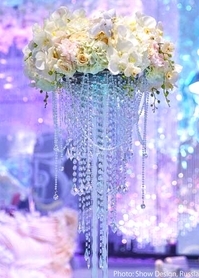 To use as a centerpiece or table decoration, this chandelier really looks awesome sitting on an Eiffel Tower Vase. U Glu Dashes are a perfect way to attach the chandelier to the vase because they're super sticky but very easy to remove (when your party is over you can hang it from the ceiling!). 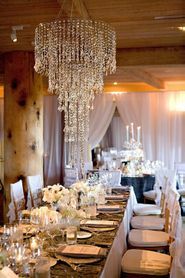 Also, we have many gorgeous acrylic beaded curtains and garlands to match this chandelier. We all love options and Ashlynn offers you many! This is very lovely and the price is just right. I actually put this in my greenhouse for a little sparkle. It would be wonderful for a wedding or any other celebration decoration. This will be perfect for the wedding. Fast shipping, great product! Love the way it looks hanging in my tent. Definitely added the right touch! Beautiful item and looks gorgeous just like the image! I bought this chandelier for my brother wedding. It seems short, but overall, it is a clean design and beautiful for lighting. The product arrived on time and in good shape, it look great in the room. 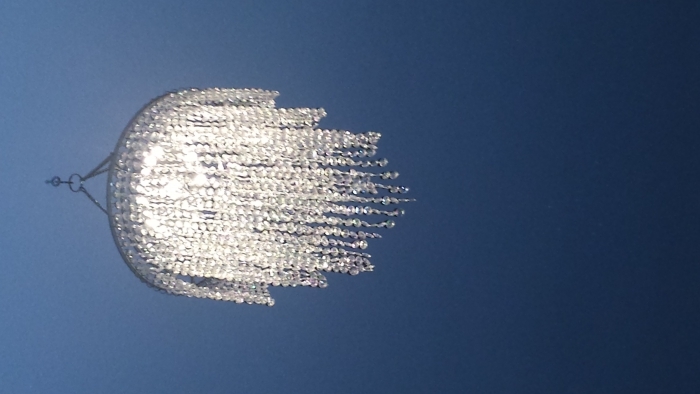 This chandelier was perfect for my bedroom! I'd always wanted one in my room to complete the glam look. I got so many compliments! Great value for the price and I hope they get more in . I can't wait to purchase more. Great looking chandelier in a nice, small size for a great price.